Apparently blogging is hard. My goal was to blog twice a week. I am not meeting that goal. I figure I better update regarding the books I have read since my last post, before I forget them or forget my perception of them. I am actually pretty far ahead on my reading goal, in spite of some lapses where I didn't read much at all. Last time I blogged, I forgot to include two books I had read already at that point- first, She Reads Truth (my sixth book of this year). This is a book written by the women who created the popular website/ bible study app of the same name. I liked it more than I have liked other books in this female Christian author genre that I have decided I am not reading anymore of. In fact, I gave it five stars on Goodreads, so I must have liked it quite a bit, relatively. Of course, the details are already fuzzy. The other book I somehow forgot to write about last time was the seventh book I read this year, What Falls from the Sky: How I Disconnected from the Internet and Reconnected with the God Who Made the Clouds by Esther Emery. This book also technically falls in that women writing about Christianity genre, except it didn't feel that way at all. The primary focus of the book for me was Esther's decision to quit using the internet for a year, and other things related to intentional living and her spirituality. It was amazingly well written. I bought the book impulsively when I walked by it in the store, and have heard nothing about it before or since. So, so good though. 8-- The Alchemist by Paul Coelho. A book that was totally worth the hype for me. It has some pretty scathing negative reviews, making fun of hipsterish people who talk this book up as the greatest thing ever written. For me, reading it was a good experience, valuable in a way fiction usually isn't, and puts things in perspective in an interesting way. 9-- This is How You Lose Her by Junot Diaz. Very authentic, I loved the way the short stories were interwoven, and I would read everything else he has written. 11-- Walking on Water, Reflections of Faith and Art by Madeleine L'Engle. I totally get how you could underline half of this book and go back to it, and there was a lot of good stuff in it, and ideas that I am really focused on lately in my creative life. All together though- it was kind of nonlinear and hard for me to get through, sometimes off topic and repetitive. I can only sort of recommend it. 12-- Restless by Jennie Allen. The hardest book to get through for me. Another female author writing about Christianity in a sort of chick-lit kind of way. I don't know why I started reading this, other than I am trying to read books that have been on my bookshelves out of guilt for acquiring too many books. I really struggled with this one, but the high Goodreads reviews suggest it might just be me. Wrong book, wrong time. Maybe. 13-- Praying Upside Down: A Creative Prayer Experience to Transform Your Time with God by Kelly O'Dell Stanley. Really, I don't remember this book, but I wasn't miserable while reading it. I am the wrong person to review this genre of books. 14-- The Summer Book by Tove Jansson. I really liked this. It is simple, with a slow pace. My girls asked me what it was about and then said it sounded boring when I described it. Maybe so. I think the primary thing with this book was comparing two generations, and finding so many things in common between the young and old in certain ways. It also made me feel sad that I don't live near water. 15-- The Four Agreements by Miguel Ruiz. I read this in one afternoon laying on a blanket in my backyard, and it was for sure a five star book for me. I hope to read the follow up/ companion book. Definitely one I am still thinking about. 16-- Spirit Junkie by Gabrielle Bernstein. No. No for me. Maybe yes for many. Not me. No. 17-- Brick by Brick: Principles for Achieving Artistic Mastery by Stephen McCranie. This was something I downloaded on my Kindle after a photography conference. It was pretty good. It was not really new information for me, but it was unique in that it was presented in a graphic novel format. 18-- The Crossroads of Should and Must: Find and Follow Your Passion by Elle Luna. This was a quick read, but I didn't feel like I could connect to the ideas so I can't recommend it. Again, this is apparently just me- if you look at the Goodreads reviews, most people love it. I am just a little bit stuck right now, reading several things at once and not really connecting well with anything. I started Miss Peregrine’s Home for Peculiar Children, primarily because my 8 year old really wants to read it so I was screening for appropriateness. I read half of it and then felt totally ambivalent the whole time about if it was ok for her to read it or not, and then allowed her to start it anyway. So she has it in her paws for the foreseeable future. I am still substantially ahead of my goal, so I am not too worried about my progress right now. I continue to read and study some larger format photography books (coffee table books? I don't know exactly how to explain what I mean there...). I found the book pictured above, Family Photography Now, while we were on vacation. I had no idea it existed, but I love it. I am also going to try to read several of the David duChemin books that I have, either again or for the first time. There you are! Books, blogged. I am still supposed to be doing a blog post about the film I have been shooting lately, but the scans come back and I am not all that excited to share them. And I have been doing some studio photography at home, which I will share with more enthusiasm. My results are not perfect, but trying to do a studio shot each day is helping me make some progress. I have learned some hard lessons. Finally, I have sessions scheduled soon, so I will be back to sharing client work again as the world turns greener and warmer. My overly ambitious photo project of 2017 was to take a photo to accompany each of the 52 books I planned to read this year. I read the first book, took a photo. The next book I read was a business book, and I was stumped on matching a photo to the book without being ridiculously literal. By the end of January, after reading five books, I realized I would be abandoning the photo project. I have never been overly excited about photos based on specific prompts, and this was incredibly prompt-ariffic (I could not think of a descriptive word there). Instead, here is a mini-review of each of the books I have read so far this year though. I will keep them numbered, so I can track where I am towards reaching my numeric reading goal. 1-- All the Ugly and Wonderful Things, Bryn Greenwood. Definitely five stars. A book I couldn't put down- but disturbing and graphic. You are reading and thinking, are we really going to go there? Is a romantic relationship going to develop between these two characters? And I am going to root for them in the end? Yes. 2-- Turning Pro, Steven Pressfield. Not as good as The War of Art, which I read last year. I finished it, which is saying something (we will get to my abandoned books shortly). 3-- The Storied Life of A.J. Fikry, Gabrielle Zevin. This book was so good. It made me so happy. 4-- A Man Called Ove, Fredrik Backman. It took me a little while to get into this one, but by the time I read about a third of it, I could see what the fuss was about. I would read another book by this author. 5-- The Phantom Tollbooth, Norton Juster. I read this out loud to my girls at bedtime. It is not an ideal read aloud book, because there are plays on words that you can't really get from hearing the book read out loud vs. seeing the words on a page. The girls were still excited to hear more every night. I know that this number is "on track" to enable me to reach my reading goal, but this number seems very small to me. I started the book How to Talk So Kids Will Listen & Listen So Kids Will Talk, and I slogged through it for over a week before realizing that it was destroying my progress. My husband was listening to the audiobook, I think at my request, after something happened that I don't remember. A child had a tantrum, or something. Whatever that thing was made me feel like I had to read a parenting book. As my husband listened to the audiobook, he started to stare at me strangely whenever I would talk to our children (he will deny this, but it is true). So I started to read it. And in summary, the book advises that you respect your children's feelings and truly listen to them. Got it. This is what can happen to me sometimes- I will really get into a habit of reading, and then I will start some kind of book that I don't enjoy, and in trying to get through the book I get stuck and stop reading altogether. Then we have Hillbilly Elegy: A Memoir of a Family and Culture in Crisis, by J.D. Vance. I started it and it just didn't ring at all true for me, so it is sitting on my desk. Everyone loves the book, so how can I not love it? I don't know. I usually love memoirs. And The Power of Off, also sitting on my desk. I have read over half of it. It was so good, and then it started repeating itself over and over. I made the mistake of reading the Goodreads reviews as soon as my doubts about the book started, and that has led me to a possible plan for abandoning it. A lot of reviews said that many books cover the same topic better, and I will look for alternatives. I feel bad for starting and then not finishing books, especially after reading so much of them, but there you have it. Finally, and also related to reading, I made the decision not to take any photography workshops online this year. I want to diversify the photography that I am exposing myself to. If most of my photography peers take the same workshops and follow the same people, then a lot of the photography starts to look the same, same, same. 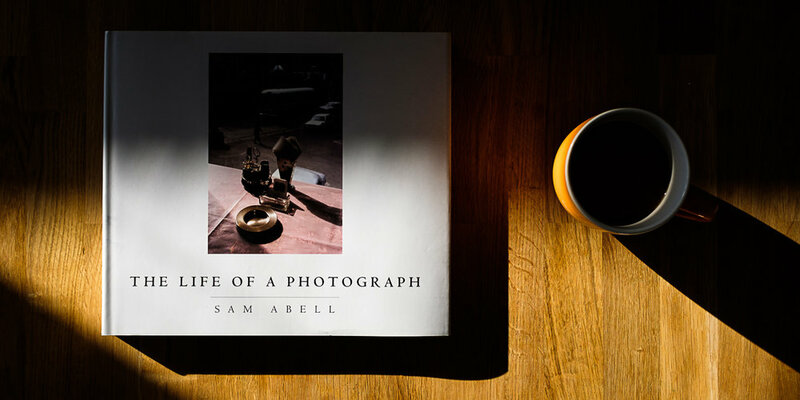 My plan is to study a book featuring a different photographer each month, and I have started with Sam Abell. Hopefully my next reading update will be more substantial. And my photos will soon feature SPRING. I can't believe it. Misty Prochaska, a Lincoln, Nebraska family portrait, lifestyle, documentary, and studio photographer.